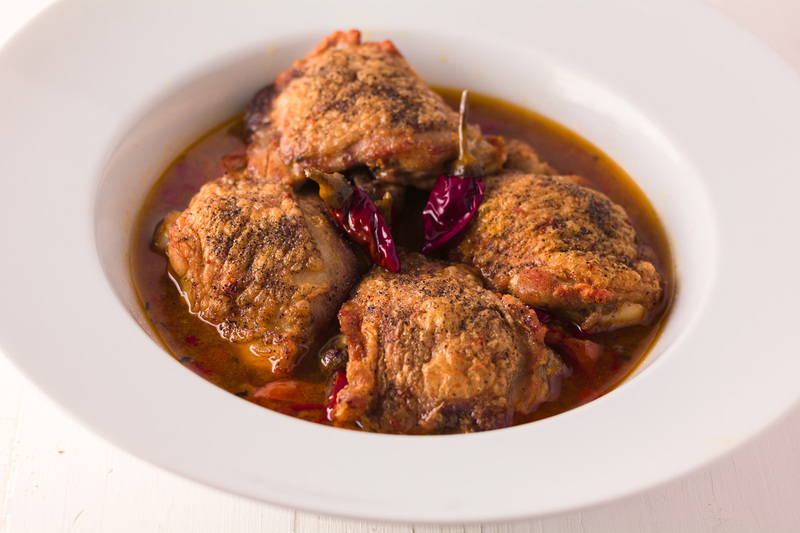 Braised chicken with Calabrian chilies – and crispy skin. That’s the thing about this recipe. Braising is a great way to cook. With chicken, though, the price you pay is flabby skin. Keeping the skin above the surface of the liquid keeps it from softening. Braised flavour with crunch. Delicious. 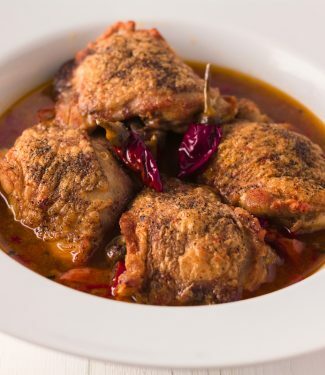 Perfectly cooked, tender chicken basted in that luscious sauce. It’s the kind of thing that can only come from delicately simmering chicken in a rich stock. A humble and yet wonderful dining experience. Comfort food. I tend to braise thighs but breasts work too. You can even mix them as long as you time it right (breasts go in after unless they are much bigger than the thighs). You have to have chicken on bones with skin though – there’s no point doing this with boneless, skinless chicken. 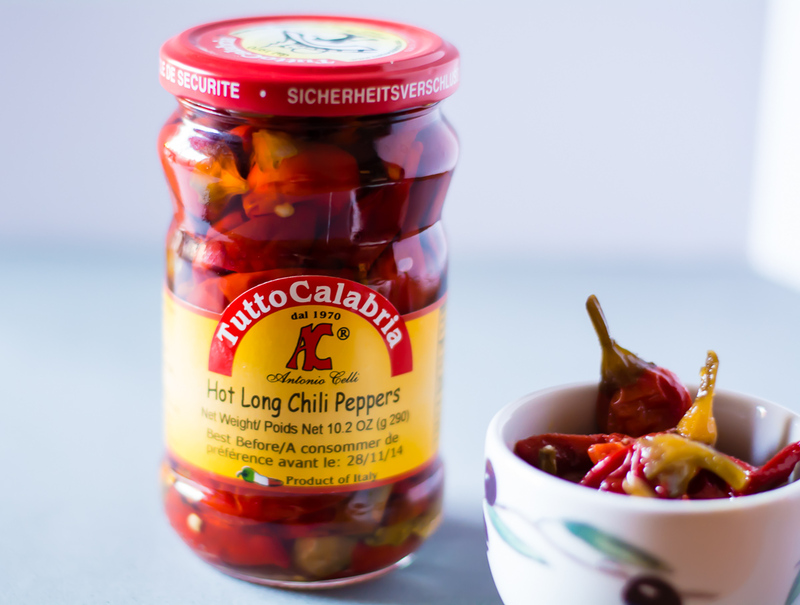 Calabrian chilies add a bit of salty zing to this dish. There not particularly hot – so don’t worry about that. Maybe a bit hotter than BBQ potato chips. I don’t know why they aren’t the next big thing (yet) but they are really tasty. You can infuse oil with them for a nice spicy oil that is killer on pizza or bruscetta. You can mix it into soup, a pot of white beans beans or maybe a lamb stew. Or you can use it in this dish. You can find them at Italian grocers. Chicken with calabrian chillies pairs well with gnocchi fried in butter or buttered baby new potatoes. Rub the chicken with olive oil and then season generously with salt and pepper. Film a pre-heated oven safe pan with olive oil. Brown the chicken, skin side down until golden and most of the fat is rendered. Remove the chicken from the pan and drain the fat. Deglaze with a splash of chicken stock and then add the chilies, cherry tomatoes and thyme to the pan. Return the chicken and add enough stock to come up to but not immerse the skin. Roast for 20-25 minutes until breasts reach 165F and/or thighs reach 175F. Keep an eye on the amount of stock in the pan and add more if it looks like it is going to dry out. You want to concentrate the stock so don't add too much. Remove the pan from the oven and remove the chicken. If the sauce is too thin reduce over medium high heat. Add the concentrated chicken stock at this point if you have it. You won't likely need to add any salt as the chilies are quite salty.